It was a nice night of sleep last night with brief light rain here or there. We knew the forecast for this morning was that it would be clear, and that heavy rain was expected after noon. 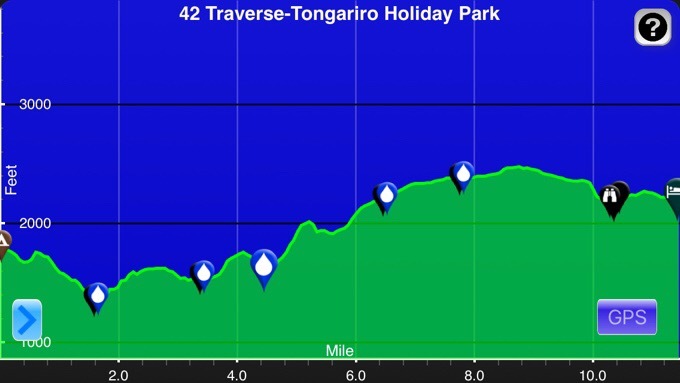 We set off at 7am with another short day planned to wait out weather and setup for the Tongariro Crossing in two days. 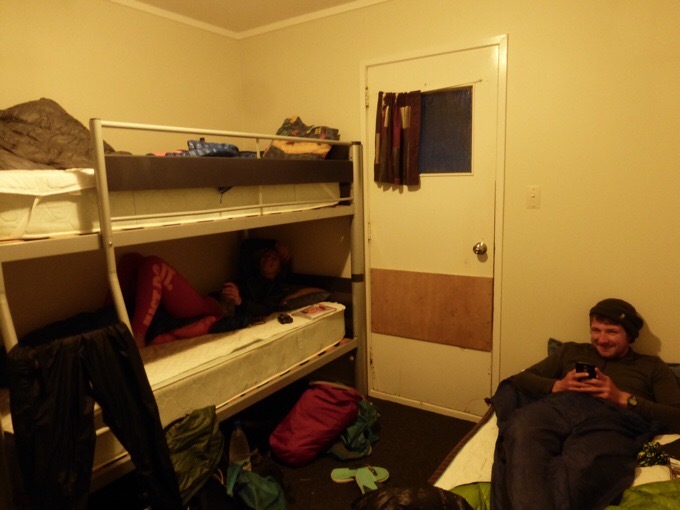 We were hopeful that we’d reach the Tongariro Holiday Park to check into a room before the heavy rain kicked in. This weather is more like fall weather and is very abnormal for this time of year. 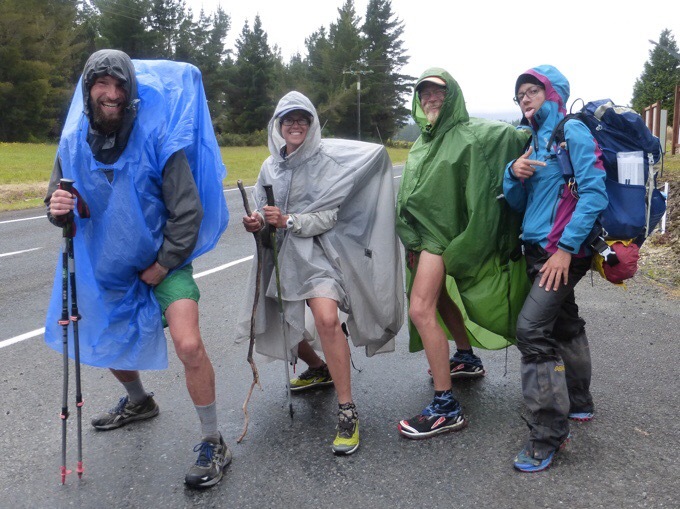 It feels like that weather that PCT hikers get late season in Washington. The kind of wet cold that just goes through you if you stand still too long. 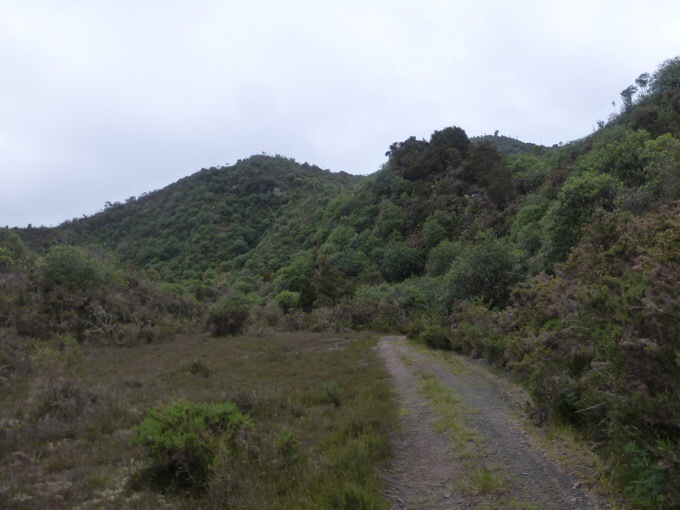 We finished out the section we were doing on the 42 Traverse and then got on the Waione/Cokers track. The description of these tracks were far more intimidating than they actually were. It was all on 4WD track, and was far less muddy and slippery than described. It’s been raining a lot, and there was a warning that the track could be quite muddy and slick when wet. It had puddles to go around, and some slick shallow mud, but it definitely wasn’t anything majorly taxing. The morning went by pretty fast, and each of us had some kind of slip or fall, but I had the best one of the trip so far. 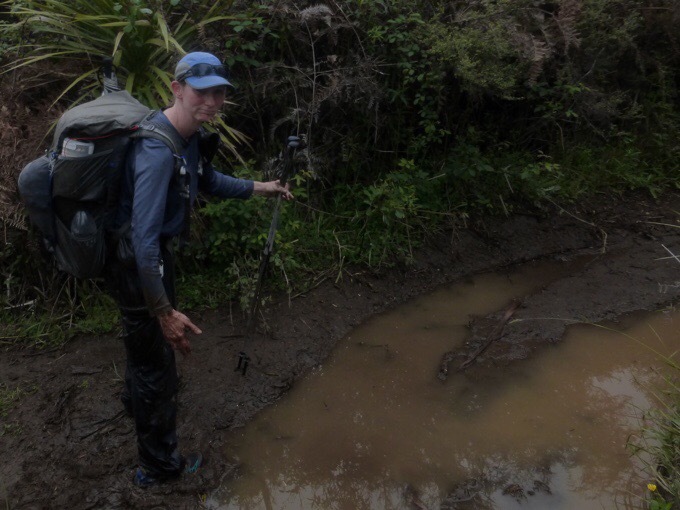 I was attempting to walk around a puddle that had some slanted mud near it. My feet went out from under me and I landed on my side. In my attempt to catch myself, my hand and arm went down right into the deep puddle. Much of the right side of me was wet as Becky and Tom got to see the entertaining fall. 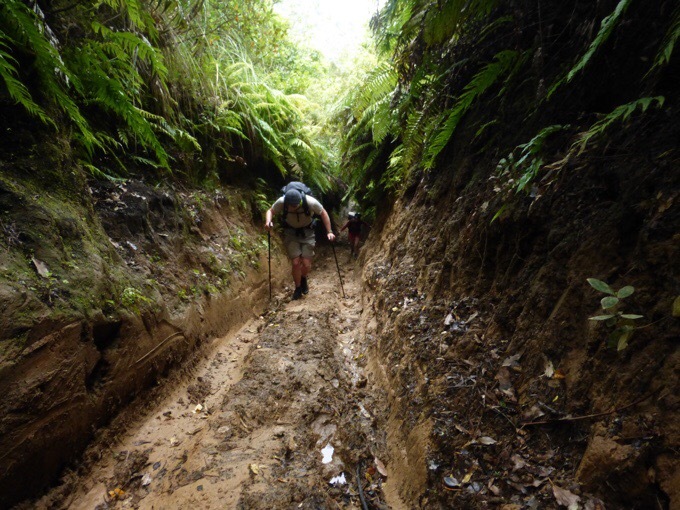 Soon after that, we entered the uphill section nicknamed “the tunnel of mud.” It was a little slick, but not deep, so it was smooth going. We also hit the 1,100km/684mi mark today. 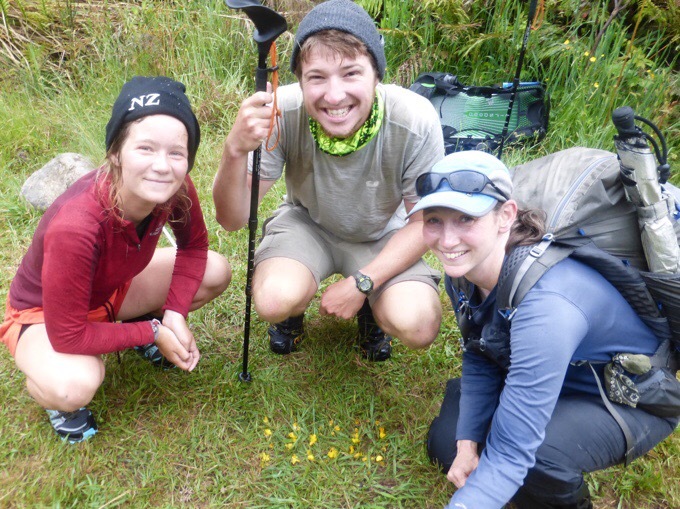 Someone had made an 1100 out of little yellow flowers, so we had to get a celebratory photo. Becky now has a ring she is carrying up Mt Doom (an elastic band Laurel gave us awhile back). She also got a cheap NZ beanie in town the other day that makes her look like a thug, ha! We’ll work on getting a more fitting beanie soon I’m sure. 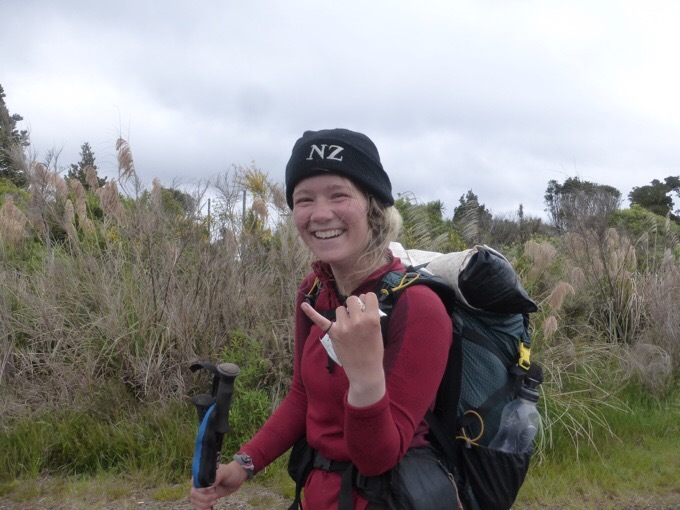 Becky with the ring and NZ beanie for Mt Doom. 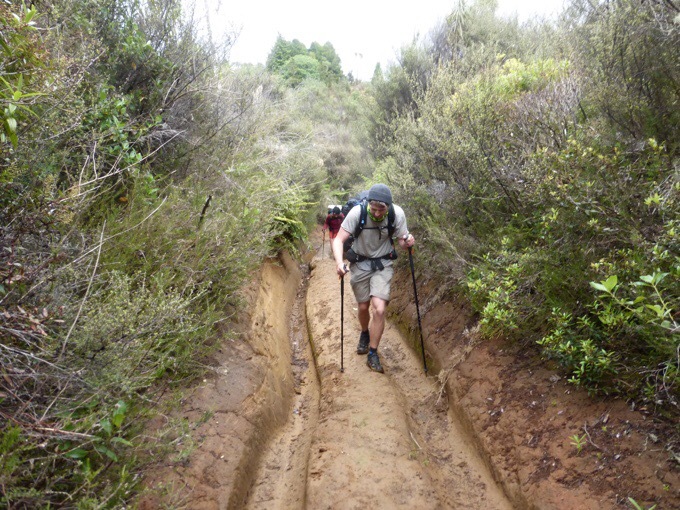 From there, it was smooth sailing to the Tongariro Holiday Park. We hit the road to the park and saw Matt, Laurel, Heartbreaker, and Vittoria. They aren’t sure if they will do the Crossing today or tomorrow, so they chose to continue on the 4mi/7km to the car park and see how the weather looks when they wake up in the morning. They took a fun photo together before we parted and we will all reconvene in a handful of days when we all do the canoe together. 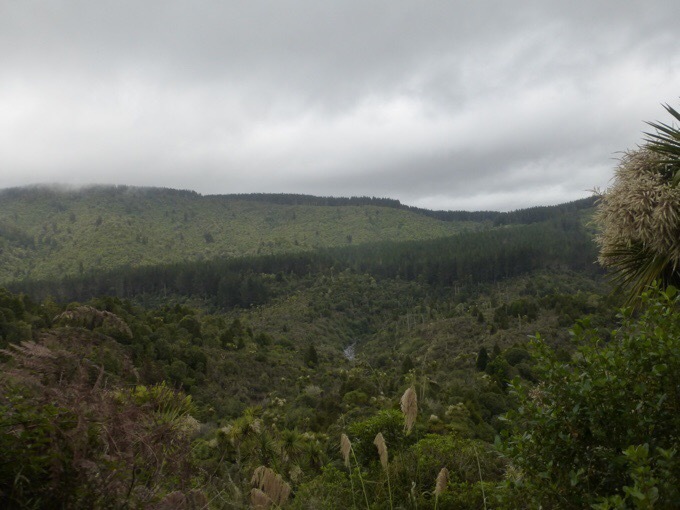 We got to the Tongariro Holiday Park before noon, and it is not surprisingly more pricey and less laid back than the other Holiday Parks we’ve been to. They are right next to possibly the biggest tourist destination in all of NZ, so they aren’t as cheap ($28NZ/$21US) and offer the bare minimum unless you want to pay extra ($10NZ/7.5US for sheets on the bed). 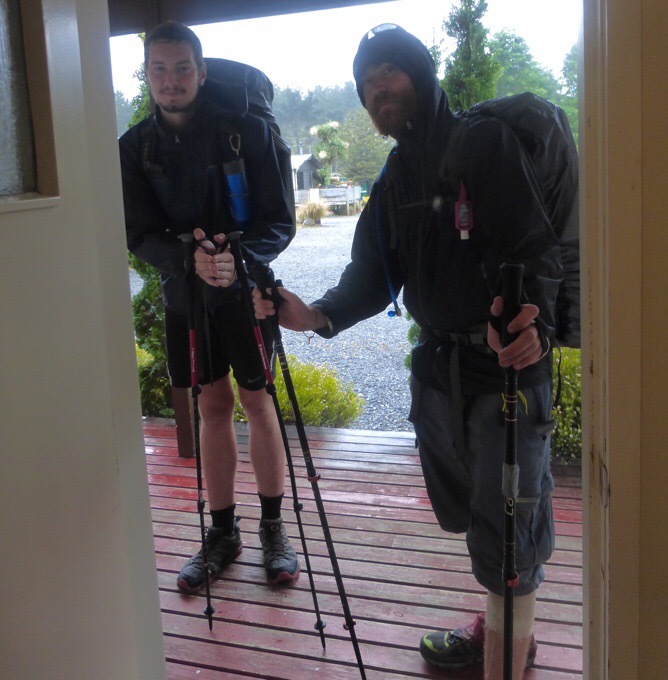 Word had spread about them being less welcoming on trail, and they said they haven’t had good interactions with the TA walkers this year, but were nice to let us check in three hours before check-in given the inclement weather conditions. Their satellite was broken, so no internet and I didn’t have phone service all day, but all we needed was a dry warm place to be for the day and we were very thankful! I’m now sitting in shorts and a t-shirt in a room that feels like a sauna while it feels like blustery winter conditions outside. Can’t get much better! 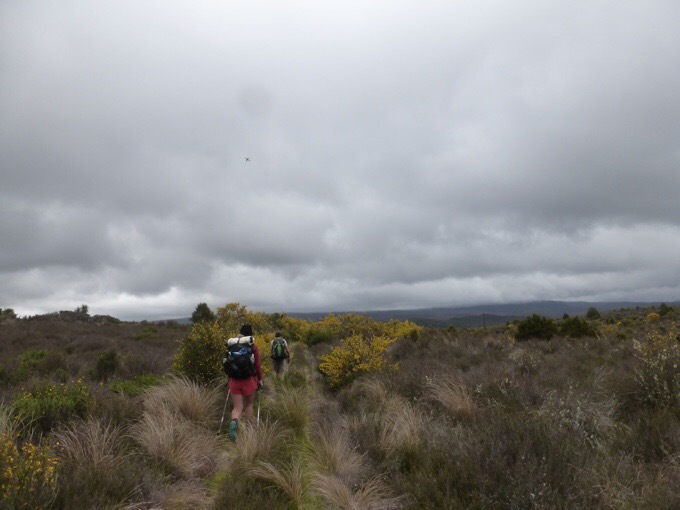 We looked up the weather to find that it would be clear, but near freezing temps and gale force winds for the Crossing tomorrow…and that’s not even considering the conditions up higher to add on Mt Doom. Then we saw warm temps and low winds for the day after tomorrow. Decision made! We will do the Crossing the day after tomorrow. It will be packed on a Saturday, but really, the weather couldn’t be more perfect, and I feel no need to go up there in such strong wind and freezing temps if I don’t have to. I know our plan seems to be changing daily, but now we have decided that tomorrow we will hitch to the end of the Crossing and hike the day long section of the TA that follows it. Then we will return to here the next day to do the Crossing on the great weather day. It’s a small shuffle, and this is the first time I’ve ever done a piece of a trail out of order, but it will be so awesome that it’s worth it. I seriously feel like a kid before Christmas with how great the weather will be for such an iconic hike. Around 12:30pm, the forecasted heavy rain for today started falling and lasted a solid 6hrs. Man, we threaded the needle on that one! Not long after we checked in, the remaining two hikers of our canoe group arrived, Fritz and Ned. They were on the fence as to what they were going to do, and decided to do what we’re doing so that they could stay here and dry out for the night and then do the Crossing on the ideal weather night. 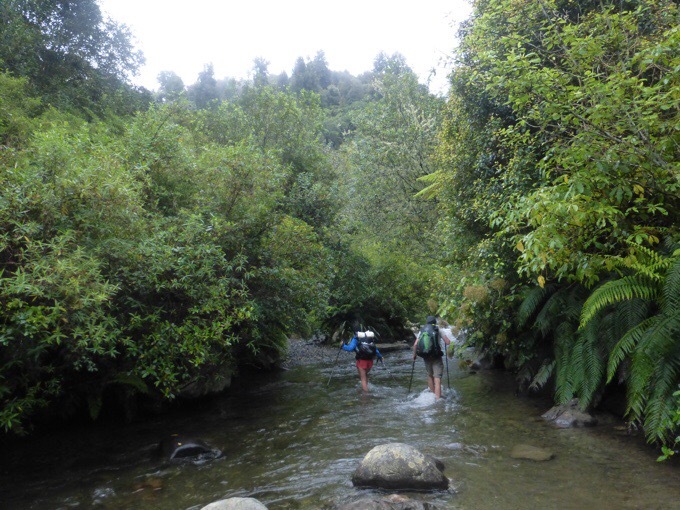 Ned said that before they left Taumarunui Felix arrived and that he might try to make our canoe date! He was wanting a rest, and would have to push to make it happen, so we’ll see. We may get to hang out with Felix some more! Fritz and Ned arrive after being in the cold rain. With a full day to fill and no wifi, the day still flew by. We took long hot showers, did laundry (it’s crazy how quick things can stink when they get wet for a couple days! ), ate plenty, napped, and I watched more episodes of Bloodline. The finale to Survivor has aired, and I was bummed to not have wifi to watch that, so it may not happen until Christmas when we stay in Whanganui. Again, this timing is perfect, and my body is happy to rest with my period to contend with. I’m not restless to move at all and am quite happy with this timing to be in a warm dry place to lay down all day. The weather should clear out tomorrow, and it will be nice to put in a full day of hiking. I am excited for you to do the crossing. It was a difficult hike for me even though I didn’t go to the top, but the views were spectacular. I haveca difficult time equating Becky’s face with anything thuggish! 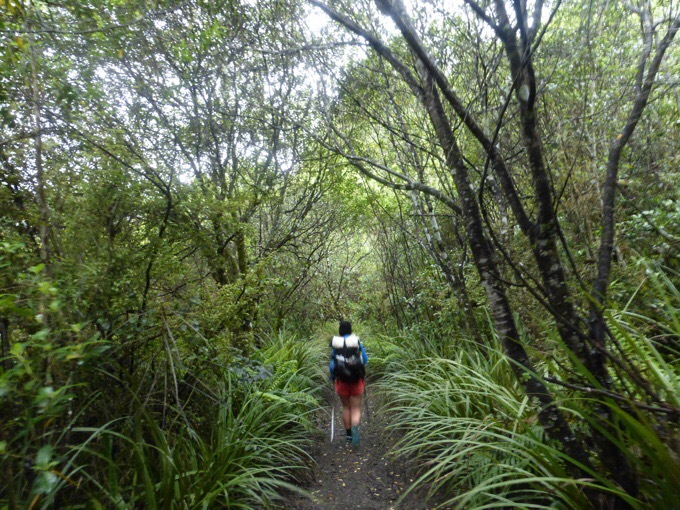 Interesting to hear that holiday park is still not a favorite for TA hikers. They treated us poorly our year (2014-15), and I guess some things never change. I know it is a busy hotspot, but there are plenty of others on the trail (mostly south) who handle the crowds much better. Glad you are waiting for the beautiful weather!!! Keep an eye out for Gollum on the way up Mt. Doom! He’ll be wanting to steal that ring!